Try juicy prime rib on the bone with herbs and Caesar dressing. 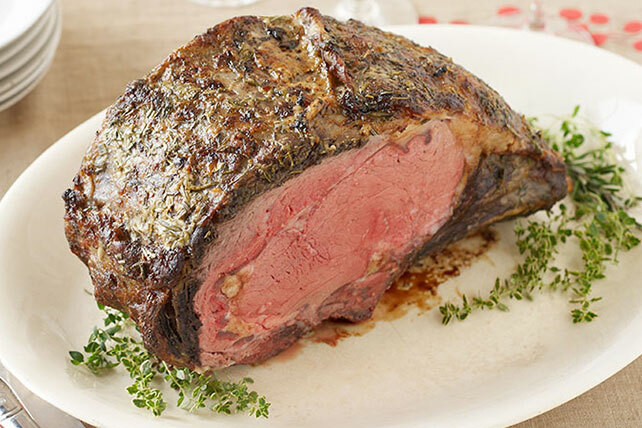 Put this show-stopping Garlic & Herb-Crusted Prime Rib recipe on the table tonight. Pour 1/2 cup dressing over meat in large shallow glass dish. Refrigerate 1 hour to marinate. Heat oven to 325ºF. Remove meat from marinade; discard marinade. Place meat, bone-side down, in roasting pan. Bake 1 hour 45 min. Meanwhile, mix remaining dressing, herbs and garlic. Brush meat with dressing mixture. Bake 20 to 30 min. or until meat is medium-rare doneness (145ºF). Remove from oven. Cover with foil; let stand 15 min. before slicing. Serve with smart sides, such as your favorite steamed vegetable and hot baked potatoes. No fresh herbs available? Prepare using 1 tsp. each dried rosemary and thyme leaves. Meat can be marinated up to 24 hours before cooking as directed.